Here are selected some of the most surprising and interesting rock-cut architecture and sculptures of the the world, arranged by the part of the world and in an alphabetic order. Abu Simbel temples – Aswan, Egypt. Two enormous rock-cut temples, built by pharaoh Ramesses II in the 13th century BC. Relocated in the1960s on an artifical hill to save from the waters of Aswan Dam reservoir. Catacombs of Kom el Shoqafa – Alexandria, Egypt. Unique medieval necropolis, cut in the rock in the 2nd – 4th centuries AD. Contain important artwork uniting art of Ancient Egypt, Hellenic art and early Roman art styles. 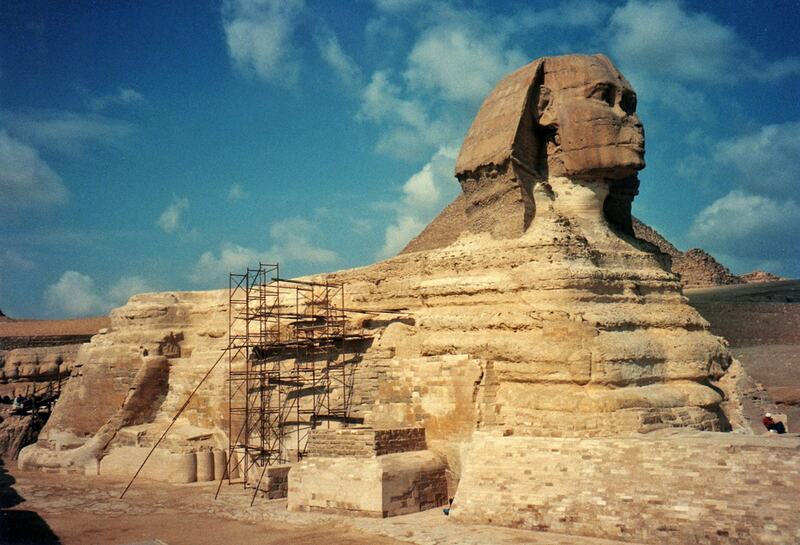 Great Sphinx of Giza – Giza, Egypt. Largest monolithic statue in the world, most likely built around 2550 BC. 73.5 m long and up to 20.22 m high, one of the most iconic sculptures in the world, central object of numerous legends and stories. KV5 and other rock-cut tombs in Valley of the Kings – Luxor Governorate, Egypt. KV5 is the largest rock-cut tomb in the wast necropolis of ancient Egyptian noble families. Belonged to sons of Ramesses II. In KV5 thus far discovered 121 rooms or chambers and it is expected that more will be discovered, complex made in the 13th – 12th century BC. In total in Valley of Kings known 63 tombs and chambers. Ramesseum – Luxor Governorate, Egypt. Remnants of statue of enthroned pharaoh, 19 m high and weighing more than 1000 tons. Largest transported ancient stone monolith, transported overland 275 km to Luxor. This feat was done in the 13th century BC. 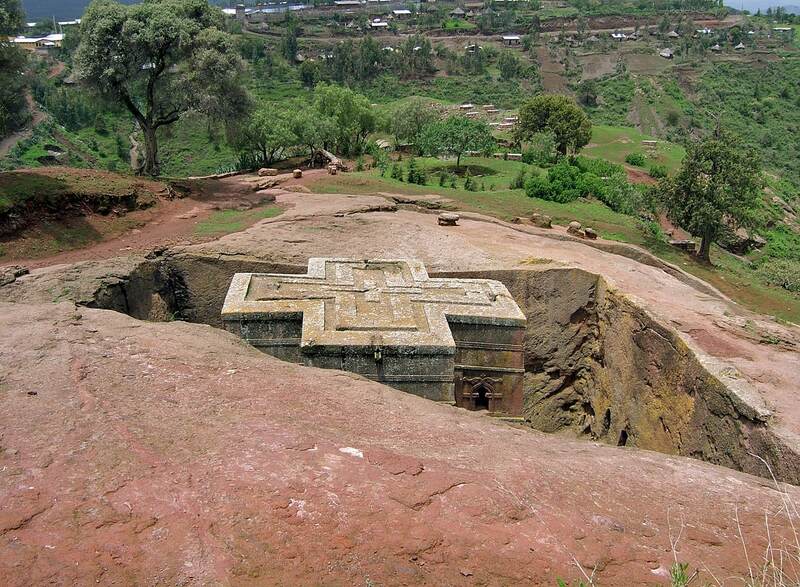 Lalibela churches – Amhara, Ethiopia. 11 monolithic Christian churches hewn underground from cliff in the 13th century. Matmâta – Gabès, Tunisia. Unique troglodyte village with numerous underground rock-cut houses in intense use up to this day. Developed as a hideaway from the scorching heat of Sahara desert, possibly existing since Roman times. TauTona mine – Gauteng, South Africa. Currently the deepest mine in the world. Gold mine, currently approximately 3.9 km deep. Total length of shafts is around 800 kilometers, temperature of rock below reaches 60 C and shafts have to be air conditioned. Bezeklik Thousand Buddha Caves – Xinjiang, China. Complex of rock-cut Buddhist cave grottoes from the 5th – 9th centuries AD. 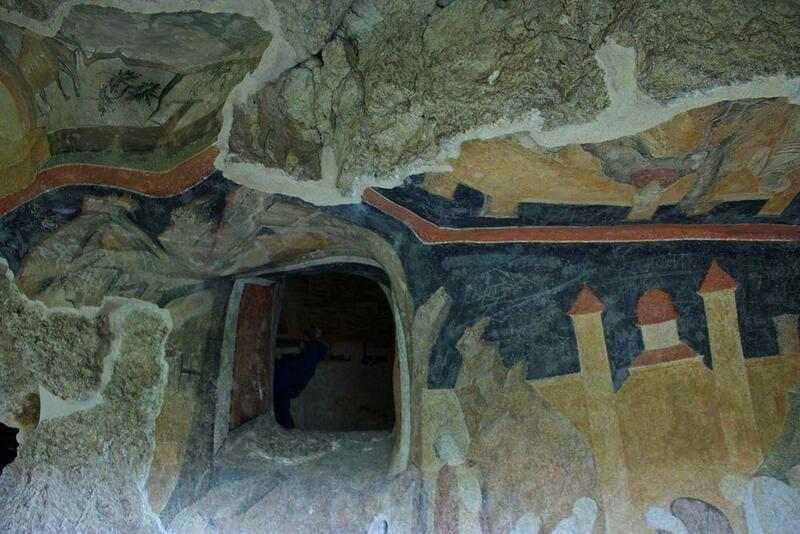 77 rock-cut caves, hundreds of murals, some show also Europeans. Bingling Cave Temples – Gansu, China. Giant sculptures and Buddhist temples cut in rock over the Yellow River. Works begun in 420 AD abd continued for more than 1000 years. Each period has left it’s own specific architectural and artistic style. In total 182 caves and 694 separate stone statues, including 27 metres tall Buddha. Many frescoes. Kizil Caves – Xinjiang, China. Rock-cut Buddhist temples from the 3rd – 8th centuries AD. Consist of 236 caves with rich murals. Leshan Giant Buddha – Sichuan, China. Largest carved statues of Buddha in world, 71 m tall. 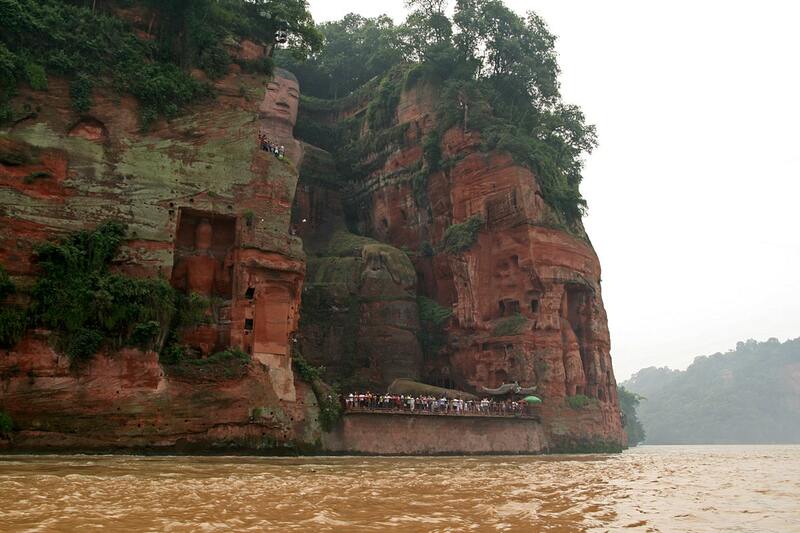 Carved in cliff face in 713 – 803 AD in hope that Buddha will calm the turbulent waters of river here. Deposited cliff residues calmed the river indeed. Longmen Grottoes – Hénán, China. Unusual Buddhist monument – two large cliffs dotted with 2,345 rock-cut niches containing more than 100,000 statues and reliefs and some 40 pagodas, rock paintings. Created in the 4th – 10th century AD. Maijishan Grottoes – Gansu, China. Rock-cut Buddhist cave temples from the 4th – 5th century AD. Consist of 194 caves with more than 7,200 rock-cut sculptures and numerous murals. Mogao Caves – Gansu, China. Group of 492 Buddhist rock-cut temples and cells adorned with huge amount of rock paintings and sculptures. Construction started in 366 AD. Yungang Grottoes – Shanxi, China. Ancient Buddhist rock-cut temples, built mainly in the 5th – 6th century AD. Site contains 252 grottoes with more than 51,000 reliefs and statues. Adorned with many cave paintings. Ajanta Caves – Maharashtra, India. Exceptional monument of archaeology and art – group of caves hewn in rock, for most part in the 2nd century BC. Caves contain elaborate carvings and frescoes, often are reinforced by massive stone columns left from original rock. Badami Cave Temples – Karnataka, India. 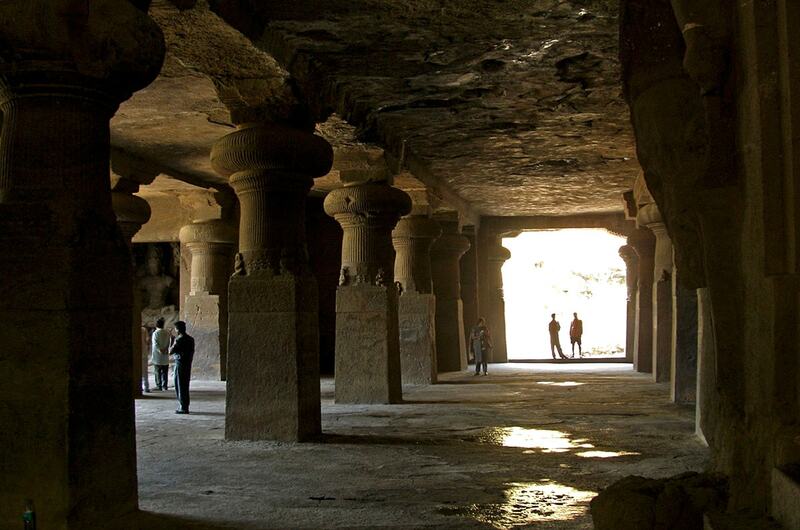 Cave temples have been created in the 6th – 8th centuries AD at the former capital of Chalukyas. Located in impressive ravine these four caves contain exquisite sculptures and carvings. Elephanta Caves – Maharashtra, India. Group of five Hindu and two Buddhist rock cut caves. Caves have been made mainly in the 5th – 8th centuries AD. Caves contain ornate sculptural groups. Ellora Caves – Maharashtra, India. One of the most impressive rock-cut architectural monuments in the world, built between 550 – 1000 AD. 34 caves contain Buddhist, Hindu and Jain sanctuaries. Includes Kailasanatha (Kailash Temple) – possibly the most splendid rock-cut cave in world. Karla Caves and Bhaja Caves – Maharashtra, India. Group of impressive, ornate rock-cut caves, built in the 2nd century BC – 3rd century AD. 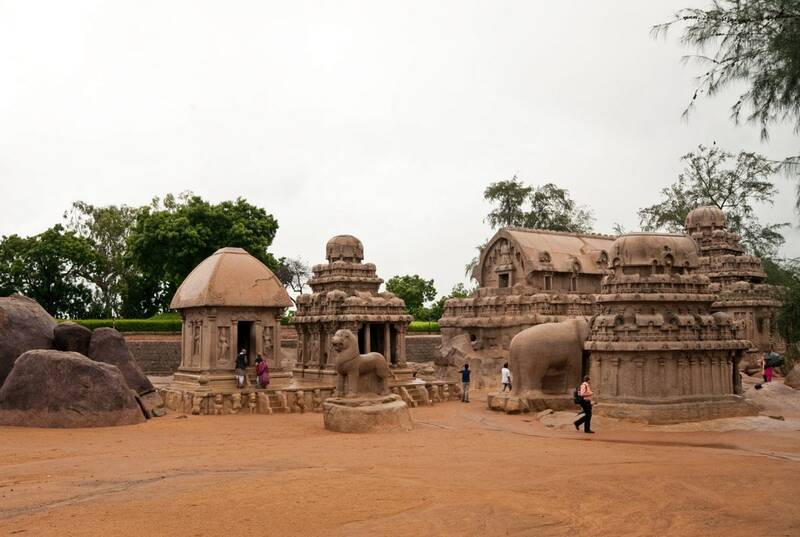 Mahabalipuram temples – Tamil Nadu, India. Group of impressive, rock-cut temples built in the 7th – 9th centuries in historical port city by Pallava dynasty. Beautiful, ornate temples. Very interesting are Pancha Rathas – group of five monolithic, very ornate shrines and Descent of the Ganges – giant, beautiful relief in open air. Part of monuments now are located under the sea level. 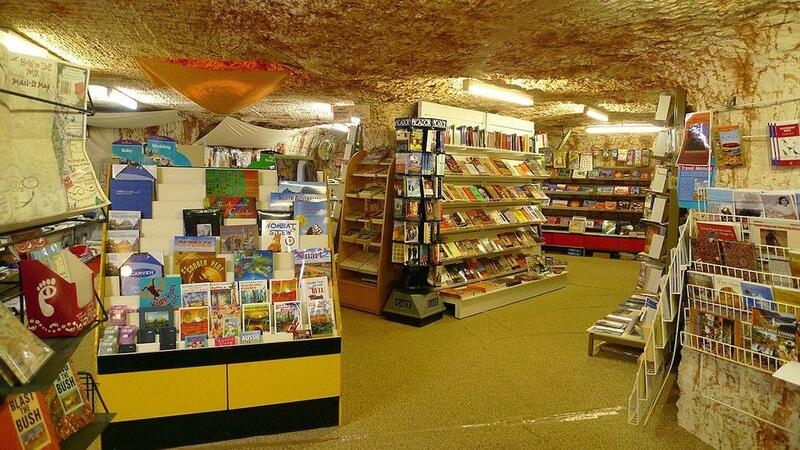 Derinkuyu Underground City, Kaymaklı Underground City and more than 30 other onderground cities of Cappadocia – Nevşehir, Turkey. Unique rock-cut cities made in volcanic rock since the times of Hittites (the 16th century BC). Intensely used also by Early Christians, often contain high quality artwork. Lycian thombs near Dalian – Muğla Province, Turkey. Group of architectonially impressive rock cut Lycian thombs from around 400 BC, located in vertical cliff. Rock cut tombs is one of characteristic monuments of this culture. Tokalı Kilise and other rock churches of Göreme – Nevşehir, Turkey. Rock hewn churches in unusual cliff formations – fairy chimneys. 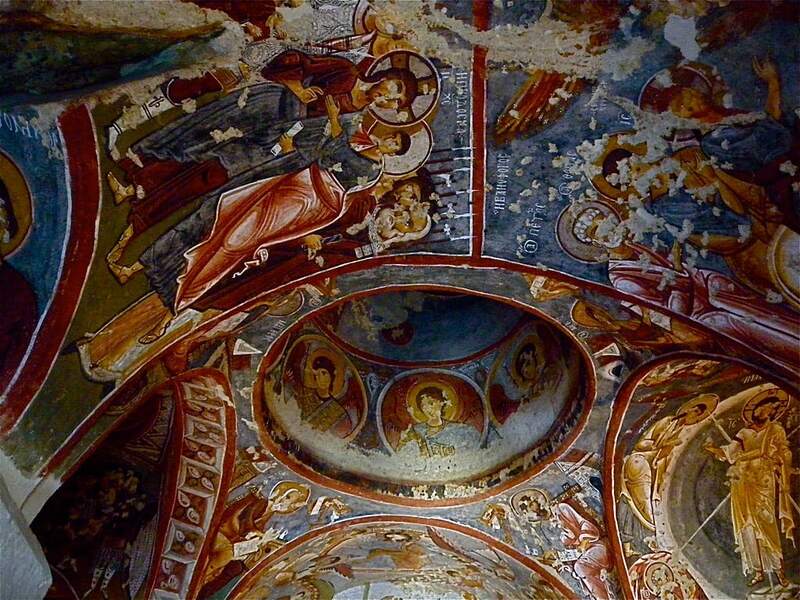 Churches built here mainly in the 9th – 11th century, contain some of the best Byzantine frescoes in world. Tunnel under Kızıl River – Sinop Province, Turkey. Possible world’s oldest underwater tunnel, built several thousand years ago for defensive purposes. Beit She’arim necropolis – Haifa District, Israel. Group of ancient rock-cut Jewish tombs from 2 – 4 century AD with interesting monuments of art. 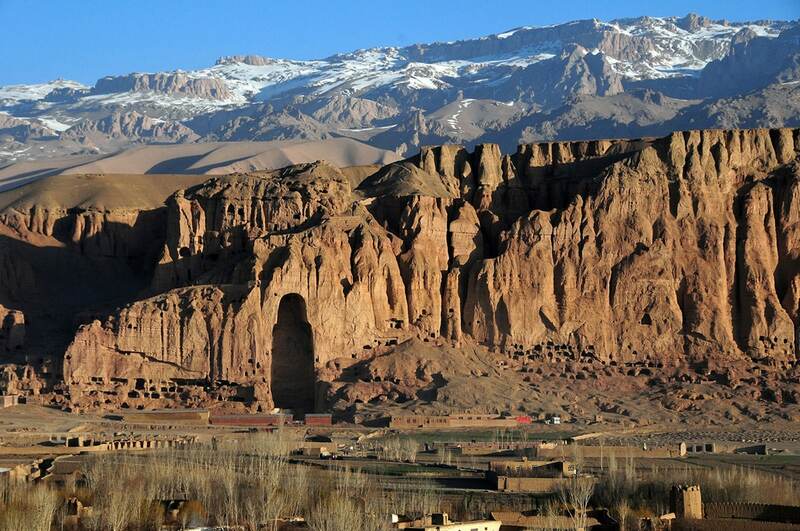 Buddhas and caves of Bamyan – Bamyan, Afghanistan. Unique monument of culture consisting of more than 50 rock-cut caves and several monolithic statues of Buddhas from the 5th – 9th centuries AD. Caves contain medieval paintings. The best known and largest statues were deliberately destroyed by Taliban in 2001. Củ Chi tunnels – Ho Chi Minh City, Vietnam. 121 km long system of tunnels and underground rooms created for defensive purposes in the late 1960s – 1970s. Dambulla Cave Temple – Central Province, Sri Lanka. A unique complex of 5 cave temples and monastery, worship has been practised here since 1 century BC, inhabited since prehistoric times. Partially rock cut caves, adorned with numerous frescoes and statues. David Gareja monastery complex – Kakheti, Georgia, part in Azerbaijan. Amazing complex of cells, churches etc. hewn in cliff face. Development of monastery started in the 6th century. Geghard Monastery – Kotayk, Armenia. Unique structure – partly carved in adjacent cliff, richly ornamented. Founded in the 4th century. Mada’in Saleh – Al Madinah, Saudi Arabia. Ancient Lihyan and Nabatean city with 131 monumental rock-cut structures – tombs developed since approximately the 6th century BC. Naqsh-e Rustam – Fars province, Iran. Group of large rock-cut tombs made for Achaemenid kings since the 6th century BC at least. Contain important artwork including enormous reliefs of high artistic quality. Petra – Ma’an, Jordan. Ancient capital city of Nabateans, established around the 6th century BC in the site of ancient sanctuary. Contains some of the most beautiful and intricate rock-cut architecture in the world, available after walking through some 1.2 km long, narrow gorge. Seikan Tunnel – Aomori Prefecture and Hokkaidō, Japan. Longest tunnel in the world, built in 1988 under Tsugaru Strait. This rail tunnel is 53.85 km long and goes up to 240 m below the sea level. Two railway stations are located below the sea. Taq-e-Bostan – Kermanshah Province, Iran. Series of beautiful rock-cut reliefs from the 3rd – 7th century AD located next to ancient caravan route. Tomb of Absalom – Jerusalem, Palestine. Legendary monolithic rock-cut tomb from the 1st century AD. Toraja tombs – South Sulawesi, Indonesia. One of the few locations in the world where the tradition of rock cut tombs is still alive. Underground passages and necropolis under City of David – Jerusalem, Palestine. Most ancient city in the area around Jerusalem, inhabited since Bronze Age. Contains multiple underground passages, elaborate rock-cut tombs from the 9th – 7th centuries BC for the high ranked people of the time. Unnamed stone block in Baalbek – Lebanon, Beqaa, Baalbek. The second largest known monolith of single stone intended to move. Weight – 1,242 tons, 19.5-20.5 m long, 4.3-5.6 m wide, 4.5 m high. Not moved. Unnamed stone block in Baalbek (II) – Lebanon, Beqaa, Baalbek. The largest known monolith of single stone intended to move. Weight – 1,650 tons, 19.6 m long, 6 m wide, at least 5.5 m high. Not moved. Vardzia monastery – Samtskhe-Javakheti, Georgia. Very impressive cave monastery in thirteen floors, founded in 1185. Served as protection from Mongols, includes also cave churches. Coober Pedy – South Australia, Australia. Opal mining town in the middle of desert. Due to the extreme heat major part of inhabitants live underground, in numerous modern apartments. Anghelu Ruju – Sardinia, Italy. Ancient rock cut necropolis made 3000 – 1500 BC. Consists of 38 structures – domus de janas. Cappuchin catacombs of Palermo – Sicily, Italy. Rock cut crypts below the cemetery of Capuchin monastery, developed since 1599. Famous due to well developed technique of embalming the deceased – as a result catacombs are filled with corpses of dead people. Catacombs of Marcellinus and Peter and other Catacombs of Rome – Lazio, Italy. Large group of ancient burials, many tends of kilometres of passageways and even underground churches developed since the times of early Christians, Jews and pagans in the 2nd – 9th century AD. Contain numerous frescoes, burials, other values of history. Catacombs of San Gennaro (Catacombs of Naples) – Campania, Italy. Extensive catacombs in two levels, developed since the 3rd – 4th century AD, contain frescoes. Important burial site. Catacombs of Syracuse – Sicily, Italy. Several extensive systems of catacombs with thousands of graves, developed since the middle of the 3rd century AD as secret necropolis of the first Christians. Necropolis of Banditaccia – Lazio, Italy. Etruscan necropolis, covering area of 400 ha, includes 1000 tombs. Many tombs are carved like mounds in tuffa with whole interior carved of monolithic stone. Necropolis of Pantalica – Sicily, Italy. Enormous prehistoric necropolis of more than 5000 tombs cut in rock in the 13th – 7th century BC. Sassi di Matera, Sasso Caveoso part – Basilicata, Italy. Prehistoric rock-cut dwellings, one of the oldest settlement in Italy, used for 9,000 years up to this day. Unusual planning, where streets often go above the roofs of other cave houses, ancient city contains maze of underground passages and rooms. Barrio Troglodyte in Guadix – Andalusia, Spain. A group of ancient underground dwellings inhabited up to this day. Built to make the life during the summer more pleasant. Bochnia Salt Mine – Lesser Poland, Poland. Oldest salt mine in Europe, established in the 12th – 13th century AD. 4.5 km long mines up to 468 m deep. Contains multiple premises including ornate church, called underground town. Catacombs of Paris – Paris, France. Former extensive Paris stone mines (approximately 400 km long network) since the late 18th century have been turned into underground cemetery where are located remains of approximately 6 million people. CERN Large Hadron Collider – Geneva, Switzerland and Rhône-Alpes, France. World’s largest particle collider, located in specially made tunnel – ring, which is 27 km in circumference. Scientific experiments here are expected to bring very important discoveries regarding the basic rules of Universe. Built in 1983 – 1988, initally used for electron-positron collider. Contains two parallel beam pipes made in extremely high precision – these pipes intersect in two places, where the collision takes place and is documented. Hypogeum of Ħal-Saflieni – Malta. Very ancient prehistoric underground temple and necropolis. Built in 3800 – 2500 BC, partly using natural caves. Mount Yamantau at Mezhgorye – Republic of Bashkortostan, Russia. Extensive, secret underground facility built currently in the highest mountain of South Urals. Odessa catacombs – Odessa, Ukraine. Extensive labyrinth of former mines, total length of passages is estimated at 2500 km. Developed since the 19th century, mining continues up to this day. Rock-hewn Churches of Ivanovo – Ruse Province, Bulgaria. Group of some 350 rock-hewn structures – churches, monasteries, chapels. Developed since the 13th century, contains well-preserved medieval frescoes. Standedge Tunnel – West Yorkshire and Greater Manchester, United Kingdom. Longest navigable channel tunnel in the world. Length 5,029 m, depth below the earth surface up to 194 m. Built in 1794 – 1811. Wieliczka Salt Mine – Lesser Poland, Poland. One of the oldest operating salt mines in world, operates since the 13th century AD. Up to 327 m deep, more than 300 km long. Miners have carved multiple reliefs, chandelier, cathedral. Znojmo Catacombs – South Moravia, Czechia. Network of some 25 km long passageways built for defensive purposes in the 14th – 15th centuries. Whole city could evacuate in a case of need and survive underground for longer time. Cheyenne Mountain Directorate – Colorado, United States. Extensive underground facilities serving as important military centre, built in 1961 – 1966. Once served as Space Control Centre and intelligence centre. Designed to withstand powerful nuclear blast nearby, with freestanding buildings inside enormous rock-cut chambers and placed on powerful springs. Confederate Memorial Carving in Stone Mountain – Georgia, United States. Largets bas-relief sculpture in the world, 12,000 m2 large. Shows three men – leaders of Confederate aremy – riding. Made in 1916 – 1972. Crazy Horse Memorial – South Dakota, United States. World’s largest sculpture in construction stage, 195 m wide and 172 m tall sculpture of Crazy Horse, Oglala Lacota war leader. Construction started in 1948. Delaware Aqueduct – New York, United States. World’s longest continuous underground tunnel, built in 1939 – 1945. Length – 137 km, width 4.11 m.
Mount Rushmore – South Dakota, United States. 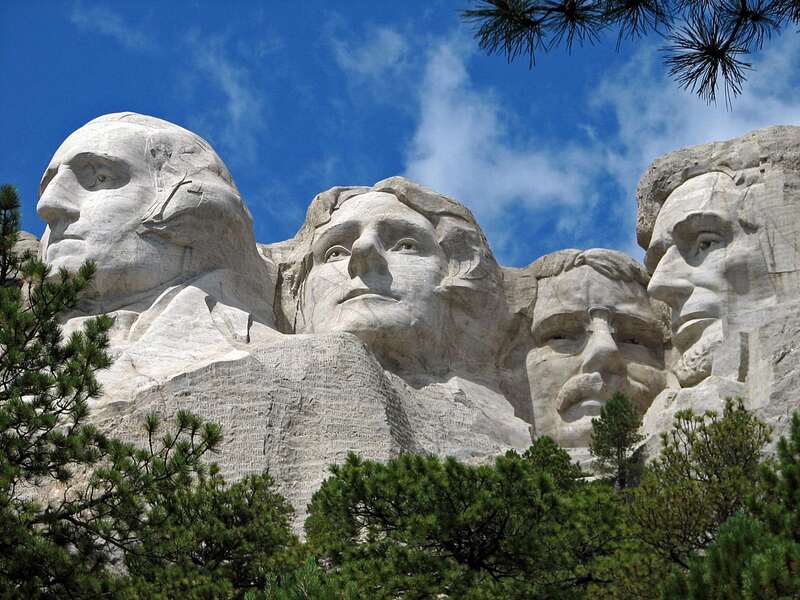 Unique sculptural group – portraits of four presidents of United States, each 18 metres tall. Sculpted in live rock in 1927 – 1941. RÉSO (Underground City) – Montreal, Quebec. Largest underground city in the world, extending under the downtown of Montreal. Contains 32 km of tunnels, area exceeds 12 km2, used by malls, metro, museums, banks, condominiums etc. Category includes outstanding rock-cut architecture and large rock cut sculptures. In order to be included in this category landmarks should be made of single piece of natural stone without moving this material from its original place. Thus here are not included such unique monuments as Ahu Tongariki and other giant stone sculptures of Rapa Nui – they have been transported away from stone-pits. Many monuments of rock-cut architecture are extremely durable due to high resistivity of rock. This resistivity and constant climate inside these structures have helped to preserve ancient art – such as the oldest known oil paintings in Bamyan Caves (Afghanistan) from the 8th century AD or beautiful tempera paintings from the 1st century BC in Ajanta Cave No.10 (India) and many other artworks. Inside the rock cut structures there have been preserved ancient sculptures – exceptional quality of artwork is seen in Elephanta Caves (the 5th – 8th century AD) or, for example, in the unique Yali Mandapam (the 8th century AD) near Mahabalipuram (both in India). Rock cut architecture is very ancient form of architecture. Some of the oldest rock cut structures were tombs and dwellings. The unique Hypogeum of Ħal-Saflieni (Malta) was developed in natural caves, gradually extending them. This was done in 3800 – 2500 BC, thus it is a candidate to be the oldest rock cut structure of the world. Most ancient rock-cut tombs in Israel are approximately 5,000 years old, of similar age are rock cut structures in Southern Italy, Sardinia, Sicily. Outstanding monument is Dwarfie Stane in Orkney Islands, United Kingdom, which also is approximately 5,000 years old. First large scale rock cut architecture was created in Ancient Egypt. One of the oldest might be the mysterious Great Sphinx of Giza which belongs to the most amazing creations of ancient people. Some consider that this giant sculpture might be created even in 2550 BC. In the 13th century BC in Egypt there were created some of the most impressive examples of rock-cut architecture ever – like the rock cut tombs in Valley of Kings and Abu Simbel temples. Very ancient rock-cut structures are located also in the Middle East. Amazing ancient city of Petra (Jordan) and rock-cut tombs of Mada’in Saleh (Saudi Arabia) were made in the 6th century BC. Rock cut Lycian Tombs in Turkey were made in the 4th century BC. Southern Italy and Sicily contain some of the oldest rock cut structures in Europe. Sasso Caveoso (Italy) are rock-cut dwellings which might be even 9,000 years old (another candidate for world’s oldest rock cut architecture). 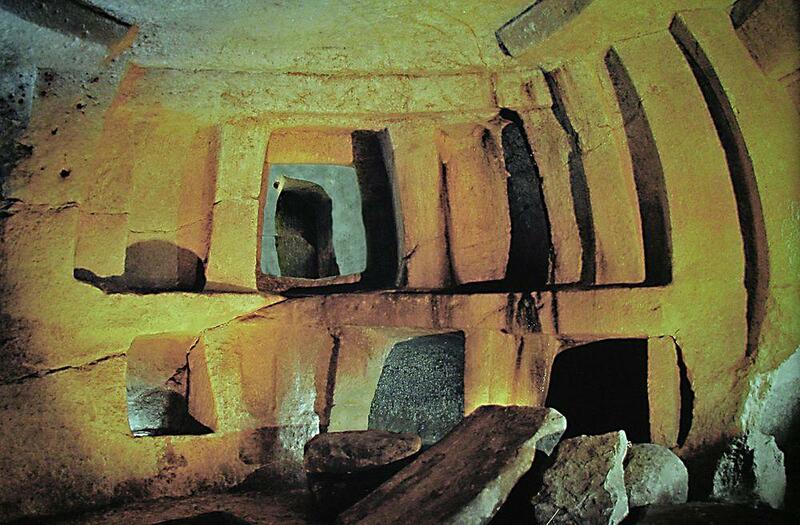 Rock cut tombs near Pantalica (Italy) have been created by ancient people of Sicily around the 13th – 7th century BC. In India the magnificent tradition of rock-cut temples started around the 3rd century BC when Barabar Caves and Nagarjuni Caves (Bihar state) were built. 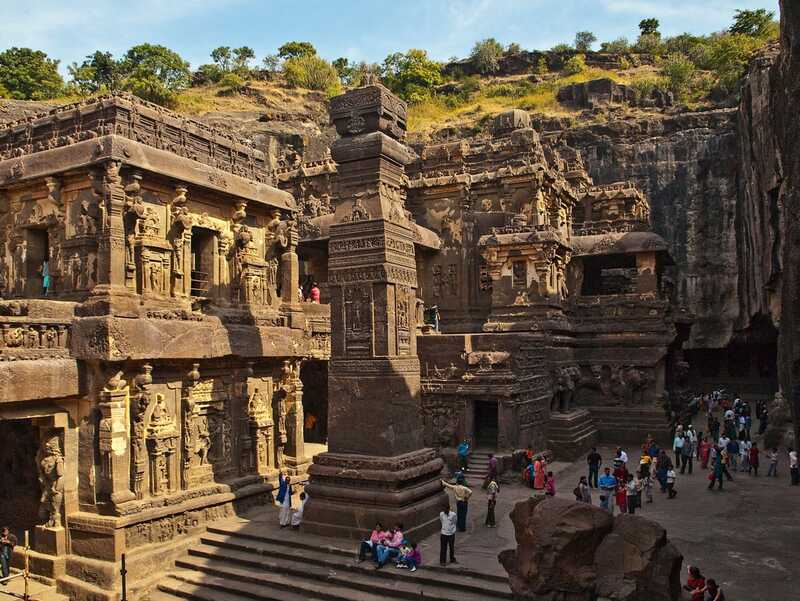 Some of the most impressive rock cut structures ever were built in India until the 8th century AD. Ajanta Caves and Ellora Caves belong to the highest achievements of architecture and engineering of this period worldwide. In other countries of Southern Asia were created similar rock cut ensembles – beautiful examples are Bamyan Caves (Afganistan) and Dambulla Caves (Sri Lanka). Another extreme example of rock cut architecture are the numerous rock cut temples in China. These ancient Buddhist temples and monasteries are amazing due to their high number, huge area of wall paintings and giant sculptures. Thus Longmen Grottoes (the 4th – 10th c. AD) include 2,345 (!) separate grottoes and contain more than 100,000 sculptures. Leshan Giant Buddha (713 – 803 AD) is a 71 m tall sculpture of Buddha. Unusual rock-cut structures were created by early and medieval Christians. This was in part the secretive character of faith in the times of persecution and in part continuation of a more ancient tradition of stone cut temples as a "direct link to supermundane". These structures have helped to preserve the impressive Christian art. Great examples are the rock churches of Göreme (Turkey, the 9th – 11th century AD), Vardzia Monastery (1185 AD) and David Gareja monasteries (since the 6th century AD) (both in Georgia), Rock cut churches of Ivanovo (Bulgaria, since the 13th century) and the unique Lalibela churches (Ethiopia, from the 13th century). Many catacombs are very old – in Near East underground passages in cities were built many thousand years ago. But construction of these underground structures flourished in the Late Middle Ages and the beginning of modern times when extensive networks of underground passages and rooms – catacombs were built under many cities of Europe and Near East. They developed as cheap mines of construction material, tombs, sewage systems and secret passages. Among the most amazing catacombs should be mentioned Znojmo Catacombs (Czechia), built as defensive system for whole city in the 14th – 15th century, more than 400 km long Catacombs of Paris (France), eerie Catacombs of Palermo (Italy) and early medieval Catacombs of Kom el Shoqafa (Egypt), containing unique art values. Most rock cut structures created after the 17th century are infrastructure objects like tunnels, mines, underground laboratories. These are the largest underground structures of the world, serving for civil, military and scientific interests. These structures have little or no value of art and architecture but represent amazing achievements of engineering. Some of the largest rock cut structures are CERN Large Hadron Collider (Switzerland and France) – exact 27 km long underground ring built for some of the most ambitious scientific experiments, as well as the 137 km long Delaware Aqueduct (United States) and 54 km long Seikan Tunnel (Japan). Rock cut tombs. Built by diverse cultures around the world and in diferent time periods with the purpose to secure long lasting abode for the deceased. Example: KV5 tomb in Valley of the Kings (Egypt, the 13th century BC). Rock cut temples and monasteries. Underground worship sites, built to facilitate religious contemplation. Most magnificent form of rock cut architecture. Example: Ajanta Caves (India, 2ns c. BC – 480 AD). Rock cut dwellings and cities. Underground dwellings, often built in vertical cliff faces. Sften serve as shelters from the heat. Example: Matmâta (Tunisia, since Roman times). Road, water and sewage tunnels. Linear structures serving for transport and shipment, built to cross mountains or waterbodies. Example: Seikan Tunnel (Japan, 1988). Rock cut defense structures. For most part built as shelters for inhabitants for protection during the wartime, but often also as secret military laboratories and weapon storage sites. Example: Znojmo Catacombs (Czechia, the 14th – 15th centuries AD). Mines and pits. Built to obtain valuable underground materials. In few cases when the mining operations end, mines are accomodated for other needs. Example: Wieliczka Salt Mines (Poland). Rock cut sculptures and reliefs. Sculptures and reliefs which are cut out of live rock. Created in different times and diverse cultures. Development of such sculptures continues up to this day, especially in the United States. Example: Great Sphinx of Giza (Egypt, 2,550 BC). Exceptional type of rock cut architecture is rock cut monolithic structures. These free-standing structures are cut out of live rock and require very high skills from their creators. Venerable examples are Kailasanatha Temple in Ellora Caves and Pancha Rathas in Mahabalipuram (both in India), as well as Lalibela Churches in Ethiopia. The present book entitled “Rock Cut Temples of Western India” is an exhaustive book that covers all the caves of Western India. The book is the need of the times as a more researched book, a more detailed book on Western Caves has not been published after James Burgess and James Fergusson. Modern view points and deeper under- Standing of the caves was essential. Books on the history of fortifications are plentiful, but the hidden forts of the nuclear age have not been cataloged and studied in the same way until now. In Underground Structures of the Cold War, the author describes when and where these bunkers were built, and records what has become of them.